Several days after moving into my new home (in a town featuring a grand total of three houses, no less), my neighbors have informed me that a professor from a nearby city wants all of the local youth to venture into the world and start catching wild animals in order to learn about their unique abilities. I present a letter from said professor to my mother, who seems far too eager to kick me out of the house and (I’m assuming) take over my massive bedroom on the second floor. And so, I shoulder my backpack and head into the tall grass. My life as a Pokemon trainer has finally begun. Pokemon X/Y released on Saturday, Oct. 12, much to the delight of lifelong fans who have stuck with the series over the past 15 or so years. I, on the other hand, was gearing up to go on my very first Pokemon adventure and, just like the main character in the game, I was lucky enough to have quite a few friends come along for the ride. As I made note of last week, despite having grown up in the Age of Pokemon, I never got around to actually playing any of the games. I decided to correct that oversight with the release of X/Y. Many of my friends grew up playing these games, but I was more or less a stranger in a strange land for the first several hours of play. But now I’m getting ahead of myself. Let’s get back to the goings-on first thing Saturday morning. As I said, many of my friends are lifelong trainers and my girlfriend, Jenn, decided to set up a Poke’-day in celebration of the new game’s release. I was disgruntled to discover that a midnight release would not be happening Friday evening and so had to put off my purchase until Saturday morning. I was awakened bright and early(ish) by the sound of Jenn’s brother, Tom, coming up the stairs. He had picked up his and Jenn’s copies of the game at GameStop once the store opened and I still had a bit of work to get done before I could run to Target to grab my own. By the time I was ready to go, Alex arrived with donuts and mimosas, thus delaying my journey to the local shop a little bit further. What? Would you say no to donuts and mimosas, even with Pokemon just waiting to be captured? I didn’t think so. When I finally got to the store, it turned out that the new clerk had been selling their limited number of copies to folks who had not actually pre-ordered the game. I was lucky enough to get the last copy of Y, which I had reserved a couple of weeks prior. I informed him of his error and made a hasty retreat, counting myself lucky that a trip into the Valley wasn’t needed in order to procure the proper version of the game. I had no idea what the real difference between X and Y was, I just knew I wanted my cool-looking flying dude, dammit. Within minutes of returning home, I had the game booted up and joined the fray. Jenn, Tom and Alex were making observations about the various improvements, new features, etc., most of which went right over my head at the time. Still, just playing the game in a room full of people offered a unique experience, greatly adding to the fun I was having in-game. By mid-afternoon Luke and his brother, David, arrived, bringing our party up to a grand total of six. We all lounged around the house (Three copies of X and three of Y, oddly enough) and kept on playing right up until midnight. We eventually had to break out a power bar, cords snaking all over the living room to keep our overworked 3DS’ running. My first day with Pokemon clocked in at nearly nine hours, the longest I’ve played a single game in a single day in more than a decade. It was a special occasion, though, and one spent with friends. And then there’s that whole addictive nature of the game that kept things chugging right along, too. While I used to have no problem grinding my way through an RPG, I typically can’t stand that type of gameplay nowadays. But something about Pokemon overrode my usual aversion to doing the same thing over and over again. I (unsuccessfully) hunted a female Combee for three hours, for crying out loud, all so I could get my own version of its final evolution that Alex was parading around the house. I found myself running through patches of grass in no time, waiting for the next battle to begin and hoping it might be with a Pokemon I hadn’t seen before. Battles work as a more complex version of paper-rock-scissors with various moves, attributes and special abilities adding a bit of depth to the process. 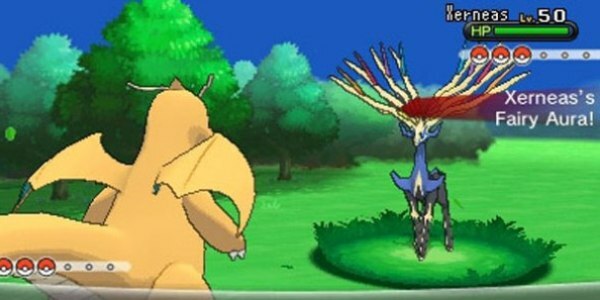 Battle with a Pokemon in your party for long enough and they might evolve, taking on a whole new look and offering up brand new abilities to master. It was probably because I’ve missed out on these games over the past 15 years and only know a few Pokemon on sight, but I found myself absolutely enthralled by this process, happily jumping into random battles for hours on end in hopes of seeing what Bunnelby might transform into. The answer is a horrible, rabbit-esque nightmare creature covered in mud. So, I ran from location to location, unlocked new modes and gear, chatted up the locals and occasionally received a nice gift for my inquisitive nature. Along the way, the constant chatter from my companions made for a nice communal experience, complete with the added bonus of having five Pokemon experts ready to help me out whenever I shouted out things like “Should I make Pokemon X forget Move Y in order to learn Move Z?” An easy decision for them, but completely baffling for someone who has no experience with the previous games. Being in a group also made it extremely easy to ask for help with O-Powers, which I’m told are new to the series and make communal play better than ever. These abilities allow players to give each other little boosts at the push of a couple of buttons. If I wanted to make sure I caught a particular Pokemon and feared I might have a tough time, all I had to do was ask for a capture stat boost and they could deliver. Having trouble in a fight? Have someone heal your Pokemon on the fly, free of charge. The online features also made trading a snap, and several members of the group had fun utilizing the mystery trade, which allows you to send one of your captured ‘Mon to a complete stranger and be surprised by what they send you in return. 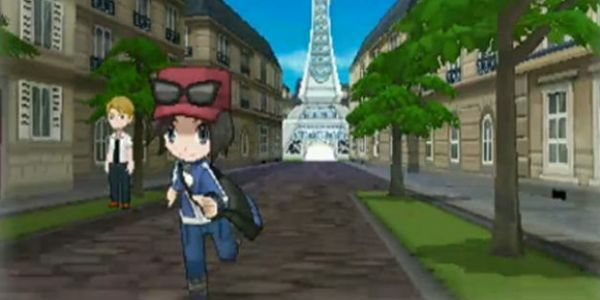 As if that wasn’t enough, the Super Training mode offers up a couple of mini-games to serve as distractions and boost your favorite Pokemon’s stats, and Pokemon-Amie adds a light “virtual pet” mode to the mix, giving you a small play area to decorate while affording the opportunity to play one-on-one with your various monsters while taking part in additional mini-games, talking to them, mimicking their facial expressions and feeding them Poke’-puffs. It’s not amazingly deep, but it’s downright adorable and easy to accidentally lose an hour to from time to time. With more than eight hours under my belt, I made it through the game’s first gym and eventually arrived in Lumiose City in order to change my hairstyle, visit a couple of cafés, finally meet the professor and claim my “second starter.” For those who are curious, I snagged Chespin and Charmander as my most special of pals. Yes, the rest of my party was well beyond Lumiose City at that point and I’ve read reviews that put my “accomplishments” at the one hour mark for the game but, again, I was perfectly happy exploring the ever-loving-hell out of the early stages of the game and just diving into a ridiculous number of battles. Would I be so head-over-heels in love with Pokemon X/Y had I been playing these games since the mid-90’s? I have no idea. But my friends sure seem to be enjoying themselves and, by all accounts, this latest version marks some big leaps forward for the storied series. I think it’s safe to say that I’ve been made a believer. When I’m not playing the game, I’m usually thinking about it, plotting my next batch of activities and wondering which new Pokemon I’m going to run into next. The game is overflowing with charm and has multiple hooks that sink in nice and deep. For the time being, I’m content to keep grinding away and eagerly await the next big story event that will carry my adventure forward. I’ll let you know in a week or two if my desire to “catch ‘em all” is still going strong, or if perhaps the luster eventually starts to fade.